The latest 1001 Inventions exhibition, and the first designed specifically for a Middle East audience, enjoyed a glamorous Royal launch in the UAE’s capital The free educational showcase, which was recently crowned the world’s “Best Touring Exhibition”, opened its doors to the public at the Abu Dhabi Corniche, where it will reside from 19th November to 24th December 2011. Large crowds flocked to the new exhibition on its opening day as it welcomed more than 2,000 visitors in the first three hours. 1001 Inventions is an anchor attraction within the Abu Dhabi Science Festival (ADSF), which is organised by the Abu Dhabi Technology Development Committee (TDC) in partnership with Abu Dhabi Education Council (ADEC). 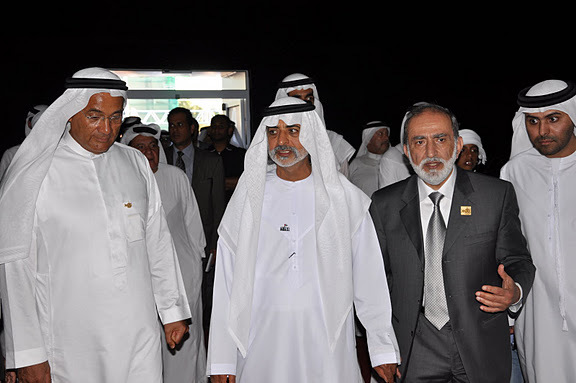 Guest of Honour at the 1001 Inventions opening event was His Highness Sheikh Nahyan bin Mubarak Al Nahyan, Minister of Higher Education and Scientific Research for the United Arab Emirates. Following successful residencies in London, Istanbul, New York and Los Angeles, where it has attracted a combined audience of millions, 1001 Inventions has launched a bi-lingual Arabic-English touring exhibition in response to persistent public demand. The new exhibition was launched at a grand opening event under the patronage of His Highness General Sheikh Mohamed bin Zayed Al Nahyan, Crown Prince of Abu Dhabi. For more information please click here.